This was, by far, the heaviest battlefield monster to have ever been built. In the Panzer tree line, it was meant to be number VIII. The Maus was in line with the German trend of making bigger and bigger tanks, and another good example is the heaviest AFV in service during WWII, the Jagdtiger, based on the Königstiger chassis. The latter was quite impressive, with its 71 ton weight and 128 mm (5.04 in) gun. But the VK 100.01 Porsche Typ 205, as it was known, was a project drawn as early as 1942, and suggested to Hitler by Ferdinand Porsche in June that year. As it perfectly matched the Wagnerian visions and obsessions of Hitler, it was immediately approved and the contract granted, with the objective of building the first operational machine by March 1944. However, this was really a monster of a tank, stretching all previous technological achievements to the very edge. Thanks to Porsche’s enthusiasm and despite the great skepticism of the Wehrmacht, the first prototype, the typ-205-1 (V1) Maus, was ready in 1943. The first V1 prototype, was at first dubbed “Mammut”, but this was changed, in derision to the ironic name “Maüschen” (little mouse), and then simply “Maus”. The main project was based around the impressive KwK 44 L/55 Kanone 128 mm (5 in) gun, which was also used by the Jagdtiger tank-hunter. With a sheer weight of 100 tons, power and track requirements soon imposed special measures. A diesel engine was fitted, coupled with a huge electric generator, which took one-third of the total length of the hull, causing the turret to be pushed back to the rear of chassis. 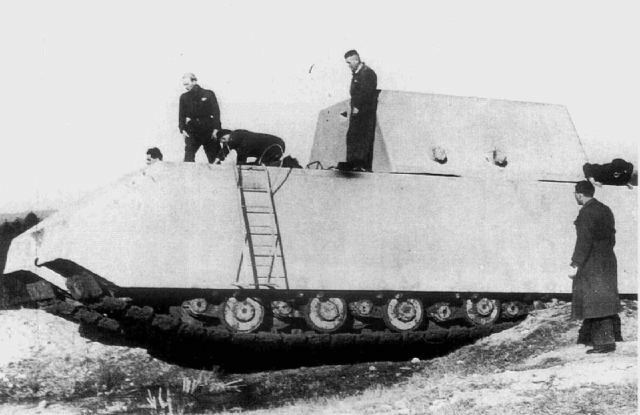 The typ-205-1 (V1) prototype undergoing cross-country tests without the finished turret at the tank proving grounds at Kummersdorf, near Böblingen. Porsche insisted to test his project of a fully electric transmission. 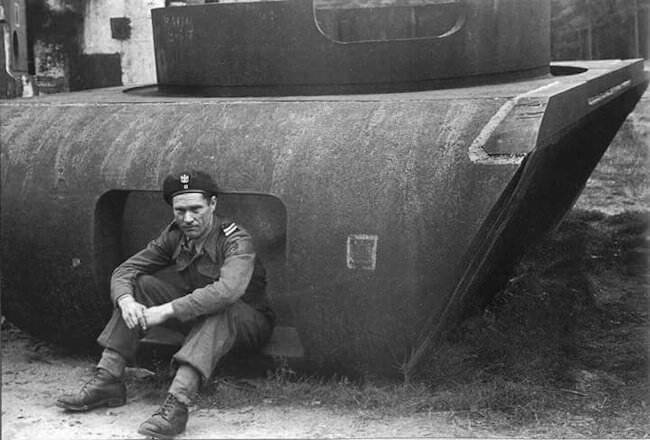 Consequently, the driver was completely isolated at the front, only communicating with the tank commander through his headgear. The tracks were abnormally wide, one meter and ten centimeters in size, and extremely thick, but were based on the usual Henschel model of a “contact shoe and connector link”, previously used on the King Tiger. 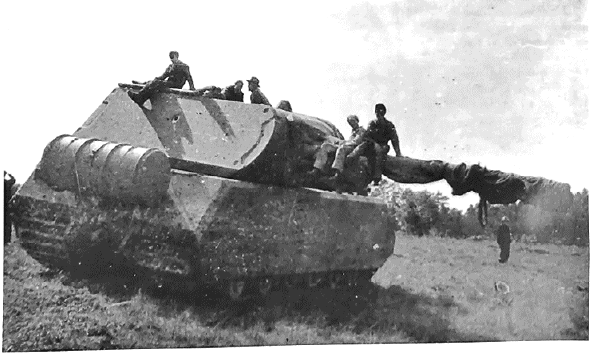 Due to the size of the tracks and a rather narrow hull for such a behemoth, largely occupied by the propulsion system, the Maus was very cramped. The armor was also extremely thick, ranging from 180 mm (7.08 in) on the sides and rear to 250 mm (9.84 in) on the frontal part of the turret. These figures were bigger those of any of the “Panzerschiff” of the Deutschland class heavily armored cruisers. Later, it was decided to increase the roof protection to 220 mm (8.66 in), in order to cope with Russian Il-2 Sturmovik attacks. An imposing vehicle such as this needs an equally imposing weapon. Main armament of the Maus consisted of the 128 mm (5 in) KwK 44 L/55 Tank Gun. The same gun carried by the Panzerjäger Tiger Ausf. B, better known as the Jagdtiger. It fired separately loading (shell then propellant) 2-piece ammunition. Its main Anti-Tank round being the PzGr.43 APCBC-HE (Armor-Piercing Capped Ballistic-Cap High Explosive). The gun would propel these huge, 28kg projectiles at a muzzle velocity of 950 m/s. These could penetrate 200 mm (7.9 in) of armor sloped at 30 degrees at 1000 meters, and 148 mm (5.8 in) at 2,000 mm (2,200 yd) range. The Maus also dispensed with the usual coaxial machine gun, it instead carrying a coaxial 75 mm (2.95 in) KwK 44 L/36.5. The gun was originally intended to be a pre-war L24 gun. However, the muzzle had to extend to 36 calibers to avoid the propellant gasses entering the engine ventilation system. A wooden mock-up was presented to Hitler and his staff on May 1, 1943. The German dictator was not impressed by the 128 mm gun (5 in), ordering a 150 mm (5.9 in) gun instead. However, the first order for 150 vehicles was given for the 128 mm (5 in) version. Production was scheduled to start in the fall of 1943, shared between Krupp for the parts and Alkett for the final assembly. Estimated final weight was about 188 tons, but Hitler insisted that it was 200. The lack of a machine gun for close defense caused Guderian to refuse the tank, as it was not a tank destroyer, and had to fight in close support with infantry. However, as the war progressed, Hitler abruptly canceled the production order in October 1943 and canceled to project in November. Despite the setback, Porsche struggled to have the first prototype ready in December at Alkett. Tests began immediately. In June 1944, a real turret was ready and mounted on the hull. As the tests progressed, two major problems became evident. The first was that the power-to-weight ratio so poor that the 20 km/h (12 mph) maximum speed figure was never achieved. 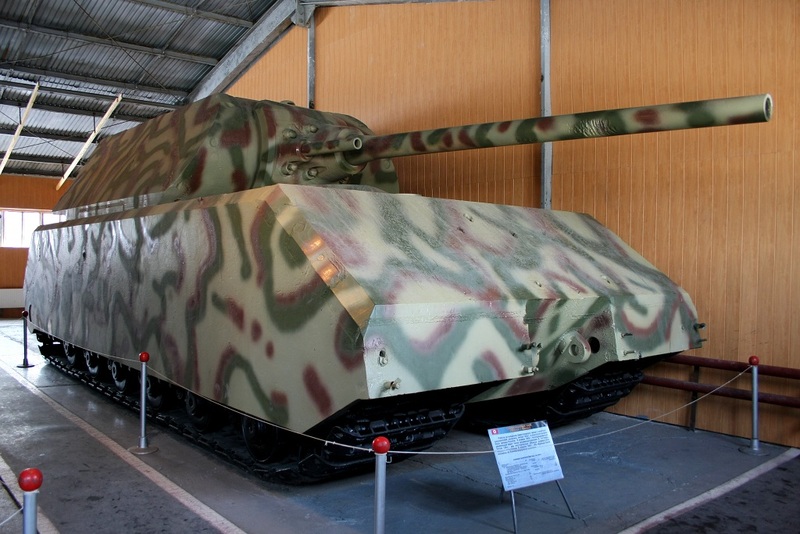 The Maus could barely reach 13 km/h (8 mph) in ideal conditions. Also, the suspension had to be revamped. The other major problem was of a tactical nature. 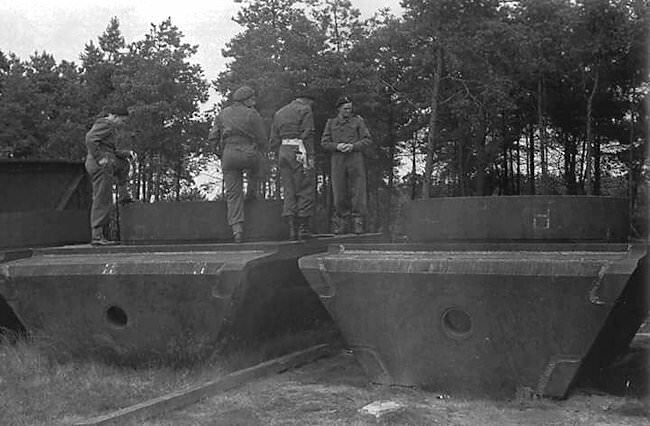 Crossing any bridge was impossible, so it was planned to have the tanks operating in pairs, one crossing the stream on electrical power, provided by a cable from the second, the air being supplied through a long snorkel. The Panzerkampfwagen VIII Maus Typ-205-1 (V1) and Typ-205-2 (V2) prototypes seen together. The second prototype, the Panzerkampfwagen VIII Maus V2, was ready in March 1944 and also began trials. It was later fitted with the first Krupp turret fitted with the intended armament, including an MG 34 machine gun for anti-aircraft defense and, later, a Daimler-Benz MB 517 diesel engine (in September), new electrical power plant and Skoda tracks and suspension system. However, as soon as Krupp started the construction of four more hulls, the cancellation order came in August. 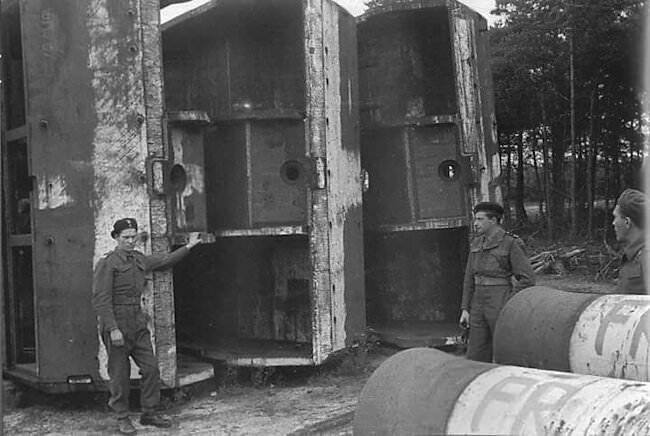 In fact, the two prototypes were nevertheless tested until their capture at Kummersdorf, near Böblingen, by Soviet forces, in the vicinity of abandoned artillery batteries, probably sabotaged. Some stories were told of the prototype firing at the advancing forces, but it was proved false. The Panzerkampfwagen VIII Maus Typ-205-2 (V2) prototypes lays destroyed at Kummersdorfnear, near Böblingen. Soon after, the Soviet command ordered the V2 turret to be mounted on V1, and the tank was tested again in Germany, and then carried to the USSR for additional tests near Kubinka, in 1946. It is now displayed at the Kubinka museum. The tank was so big, that the building it sits in was effectively built around it. 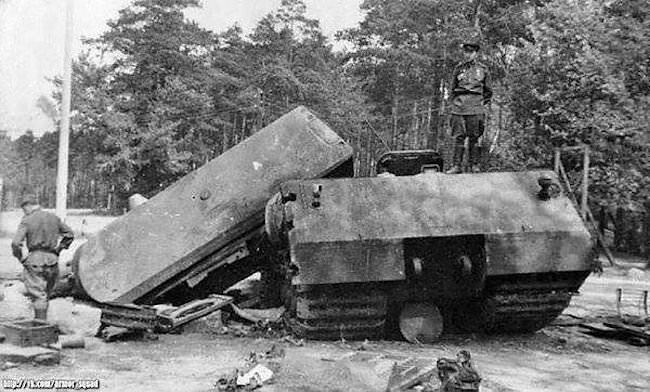 The Panzerkampfwagen VIII typ-205-2 (V2) Maus prototype was destroyed prior to the tank proving grounds at Kummersdorf, near Böblingen being captured by Soviet forces. Later the turret of this tank was recovered and placed on the chassis of the typ-205-1 (V1) Maus. Four additional armored Maus Wanne (hulls) and five Turmgehäuse (turrets) had been welded together at Krupps factory in Essen before it was bombed on 4th August 1944. Production stopped after that. This photo was taken at Meppen, Krupp’s firing range. Front view of a Panzerkampfwagen VIII Maus tank turret discovered by Allied forces. This photo was taken at Meppen, Krupp’s firing range. 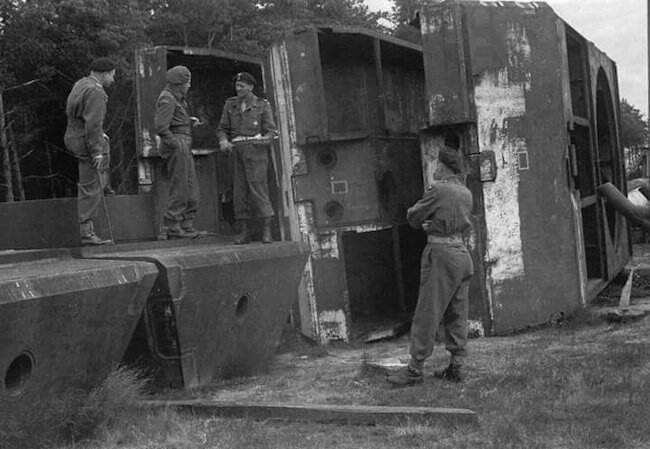 Rear view of an upside down Panzerkampfwagen VIII Maus tank turret discovered by Allied forces. This photo was taken at Meppen, Krupp’s firing range. Unfortunatly these Panzerkampfwagen VIII Maus tank turrets and hulls were scrapped after the war. This photo was taken at Meppen, Krupp’s firing range. 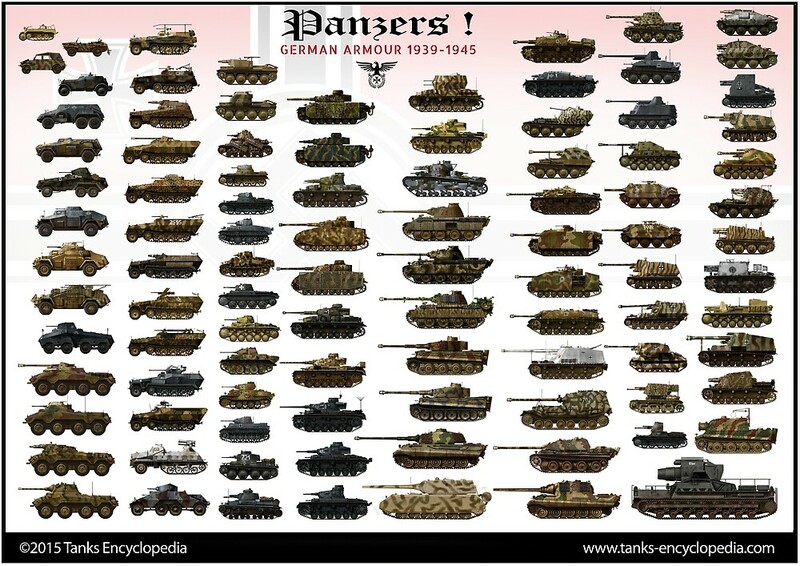 Panzer Tracts No.6-3, Schwere Panzerkampfwagen Maus and E-100, development and production from 1942 to 1945. Thomas L. Jentz and Hilary Louis Doyle. The Porsche Type 205 compared to a Polish TK tankette. It shows, immediately, the German Panzer development in four years. Behind the tankette, the V1 prototype, as it was found by the Soviets, in September 1944. The turret was a dummy, but shaped and loaded like the real one. Before testing it at Kubinka, the Russians mounted the V2 turret on the V1 hull. Camouflage was the autumn one, but there were no markings, as it was never commissioned. Fictitious Maus of a schwere Abteilung defending east Berlin in the fall of 1945. This tank may have been a true monster, but it would never work right. Against Allied Tanks this thing would rock… but so already did the Tiger 1, Panther, and King Tiger, and their solutions for them were either some kind of AT gun, or an air strike. Maus being Slow would be a prime target for an air strike. The Maus was indeed quite slow and it would have been extremely difficult to hide from allied planes. We can only guess in case of engagement it would have been moved by night and then camouflaged in some area defending Kummersdorf due also to its poor range, inability to cross bridges or being carried by rail. But it needed another MAUS since the Diesel engine couldn’t run under water there was a long power cable to run the electric motors. The snorkel was to keep the crew alive. yeah. but i’m sure more modern bridges might be able to stay stable with the maus driving across. Also, from another website I frequent, there was to considerable secondary armament for the Maus. “Main armament was a variant of the 128mm Pak 44 anti-tank gun. Secondary armament consisted of a co-axial 75mm gun and a 7.92mm MG34 and a 100 mm grenade launcher to deal with infantry. In addition, the crew had three pistol-ports through which personal weapons could be fired to defend the tank. Plans to mount a rear-firing flamethrower and a vertically-mounted 20 mm cannon to attack any aircraft that flew directly overhead were not implemented by war’s end.” The website I got this from is rather reliable. Even if it can resist airstrikes, its a large slow moving target for aircraft. I am sure a thousand pound bomb could destroy the crew from simply the concussive force without even harming the tank. Exactly… That is the point. But also, the MAUS was designed with a 150 mm cannon, so this behemoth would have been able to fire pretty accurately at a distance of 2 miles away, and with 9.5 Inches of solid metal I really doubt any shell an arty could shoot would put the MAUS away for good. Yes it would. SO slow in fact it makes the ideal infantry support vehicle—until a bomb lands on the bloody thing. How would napalm have worked against the engine air intakes and the crew’s air supply ? It says the one of the turrets was a dummy so they had to transplant the turret if I’m reading this right.Anyway any idea if they could still fire today.I would love to see such a behemoth of a tank just drive turn the turret aim and shot a few targets!Laso there was a war ship that was camouflaged as an island to hide it before handing this tank is possible depending where its stationed.Would love to see it in working order and shooting some targets. Actually, the turret traversed at 8 degrees per second. Which is not bad for a German tank of WWII. Unfortunately there is nothing left of the interior since the Germans blew it up, so there is no chance of seeing it firing. 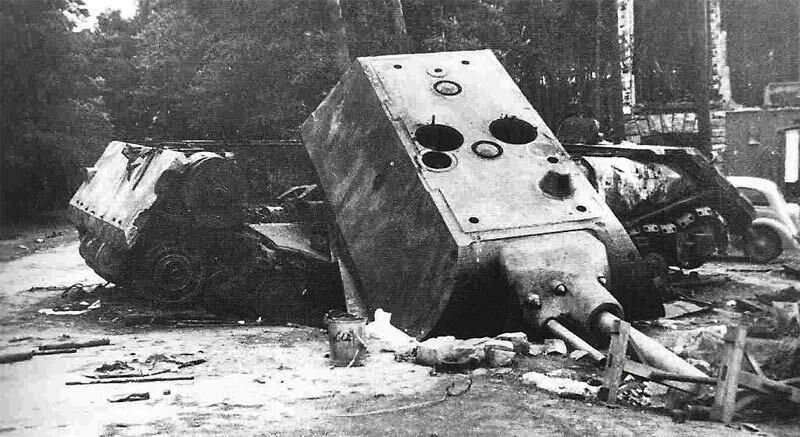 The Maus was going to be restorated but it was abandoned in favour of some Soviet tank iirc. As stated the Maus was a typical Hitler solution in an attempt to stem the tide of the war against the Germans. Wasted resources on “Wunder Weapons”. They already had a formidable panzer corps. What they needed was quantity. The soviet T-34 was roughly built game breaker that overwhelmed the superior panzers through sheer weight of volume. Even if a 100 Mauses were produced the allied air forces would have pounded them into wasted scrap. Well, plus the fact that the chassis, engine and suspension had to be supersized to handle the weight, and that the Germans were unable to produce a good enough engine for the monster. The Panzer VIII Maus Tank is pretty fast for it´s size and 188 tons. I personally would love it if Germany had mass produced these. They would look great in the history books. The Maus was truly a wonder, and it would have been a true terror for Allied tanks, but obviously the air-force would have loved popping them, and that would have been fairly easy. The Maus would have been heavily modified over time if it had gone into production, and it would be interesting to see how it would have progressed. However, it would also have likely saved lives, due to the obscene amount of resources it would have wasted. The money steal and oil to run and build these, would have devastated the amount of other, more practice, weapons that could have been created. Nonetheless though, I would love to be able to see these in museums around the world along with a Ratte or two. I can totally agree with you, but don’t you think that all other Allied countries would have taken after the idea and started to create higher caliber weapons and tanks to defend against these Wunders? I mean if the Americans knew what was happening in Germany at the time, they could have easily stopped producing the Sherman’s at the time and focused on producing a more functional armored vehicle. Btw Air force would never be able to destroy the maus unless a b-17 happened to luckily hit one at 16 thousand meters with a really inaccurate bomb. That is why they would go for cites with their huge payload. Also ground attackers didn’t carry bombs big enough to destroy a maus. The only way to do so would to land a bomb on the engine bay. And even then the turret could still be used. Perhaps the gun damage could knock out the main gun but it still had a coaxial 75 mm gun. Perhaps not completely destroyed but if high-explosive bombs were dropped, rather that armor piercing, the blast could sufficiently damage the main gun or tracks, and they would not necessarily have to make a direct hit depending on the size of the bomb. This would strand the tank without any vehicles capable of towing it back to a repair facility, this would force experienced technicians to repair the machine while on the front lines, making them highly vulnerable. Also, both the United States and the U.K. had bunker busting bombs that could have destroyed it, with or without direct contact; however, this would be a huge pain for the Allied air force, as most of these bombs required a modified bomber. i know this tnak was a monster but i’m looking to buy a model of this tnak so ic an have it. can anybody help me? I got a nice little 1:72 scale Maus by a company called Easy Model. Its an already built one. Professor Porsche didn’t just build or design the Maus: could we perhaps see an article on the other projects he worked on, like the Porsche 245 light tank? I did not read all, but pics are sick! I have a very unkind nickname for this piece-of-crap vehicle: the self-propelled barn. Yes the Germans made a lot of quality equipment. ,Had the concentrated their efforts in producing more mark4 tanks, those tanks had good guns. They could have one. The giant tanks they wanted to make cost too too much money to make,too much material to use .too Long to make just 1 one tank. And Germany was not a very large country like Russia ,united stated or the British commonwealth of nation. Germany did not have a lot of manpower and raw materials. I could see Russia ,u.s. ,great Britain making such tanks ant even 10 to 20 times bigger than the Maud or the ratt tank. But what’s the point. Even for those3 supper powers, they just wanted to get the war over and done with. I could see the united state or Russia or great Britain , coming across with a Maus or ratt tank , 2, 5 or 10 times bigger than those of the Germans, yea, so there they come the allies with these unimaginably Huge tanks crossing the rine with their long snorkel and the soviets on the other side with their monster tanks just Crushing every German tank from a long distant . yea that I could imagine. I think the allies where smarter in the respect. But the allies could have built anything the German did but many times Bigger and Much more Powerful the the Germans if they really wanted Too. The allies wanted a quick victory. Not a war that was going to last years into the future. Imagine ww2 going into the 1950,s . I wonder what would happen if this tank and the rest of the Wunderwaffe was completed during WW2. Chances are they wouldn’t have changed much. Many of the ‘Wunderwaffe’, while interesting on a technical level, were not especially relevant on a strategic level and were in many cases highly impractical. Having too few of something to really help you in a war does not diminish the quality of that something. Quick question is the Maus still fully operational? or is that impossible to check right now? Unfortunately, the surviving Maus is merely a shell. During testing, a large fire gutted most of the inner components of the tank. aw that’s a sad thing to hear i am really fond of the Maus but that is a really interesting fact thank you for telling me. Likewise. Not a problem. If you are interested in the Maus, I recommend this book. It’s almost like a ‘Maus Bible’. thank you but i have another question and sorry if this question seems like a waste of time but what is that barrel looking thing behind the Maus? 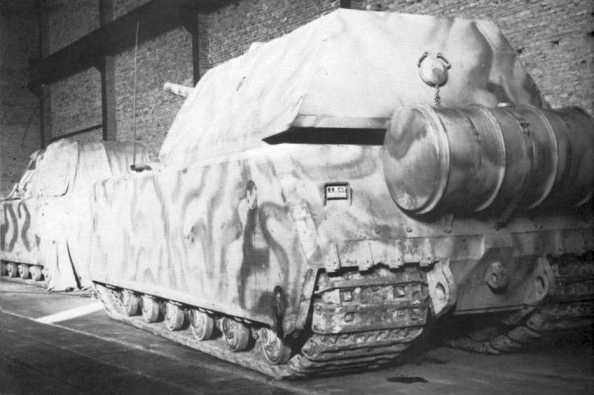 Well I Think this tank is cool, my favorite tank is the P 1500 Monster Landkreuzer, even though it wasn’t made, that tank would have been epic! But if I don’t count that tank, this tank would be by far the best. Could Tank Encyclopedia please offer some explanation regarding the “Tiger Maus” design? I can find numerous websites that mention it, but I can not find any images or in depth explanations. From what I understand, it was a design combining the tiger 1 hull and maus turret, and that seems absurd from a weight standpoint, but I suppose it would be a way to get the 128 onto the battle field. Hello Ekrub, we’ll put it on our list, however, do note our list is currently humongous and it might take some time. Also, please consider donating on our Patreon account, it helps us publish faster.